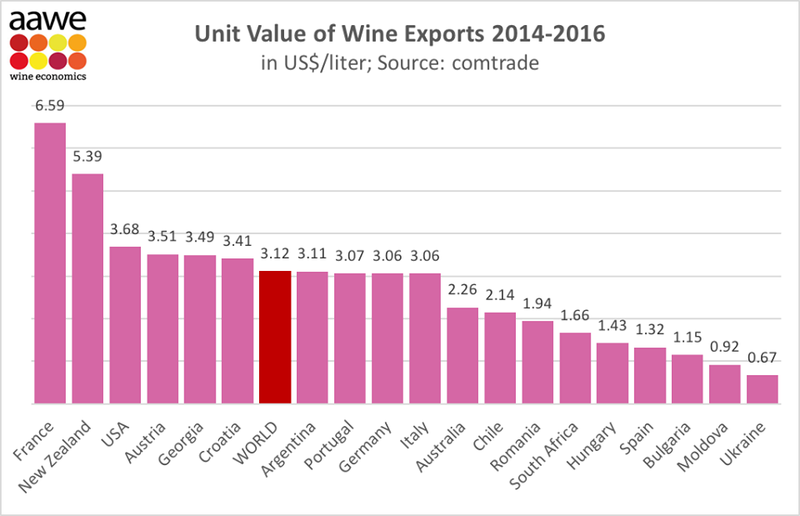 The Georgian National Wine Agency (NWA) reports that according to American Association of Wine Economists (AAWE) ratings, Georgia was ranked 5th place in the world by wine export price at $3.49 per liter in 2014-2016. AAWE ratings place France in first place with an average cost of $6.59 per liter of wine, followed by New Zealand at $5.39 and the United States at $3.68. Austria is just ahead of Georgia, taking fourth place with $3.51 per liter of wine. In the rankings, Georgia is ahead of countries such as Croatia ($3.41), Argentina ($3.11), Portugal ($3.07), Germany ($3.06), and Italy ($3.06). Irakli Cholobargia, Head of the Marketing and Public Relations Department of National Wine Agency, says that this rating is indicative of the high quality of Georgian wine. Together with Georgian wine exports, the quality and price of Georgian wine is increasing on the international market. The current conditions were preceded by agreements within the wine industry, the right marketing campaign, and concrete steps taken in recent years to improve the quality of Georgian wine,” he said.